Relax! Animal Behavior Network guarantees your complete satisfaction or your money back. Welcome Guest! These are short descriptions of the topics only. Enroll to view additional content. Error-Free Puppy Raising™ arrives as short lessons by email, customized to pets and people. Each ELesson arrives with a pet cartoon and easy links to Positive Dog Parenting™ and other Animal Behavior Network online library topics, videos and presentations by Dr. Rolan Tripp. A puppies brain is like wet clay in the first few months of life and therefore, Puppy's future personality and social skills are now the easiest to mold. As that clay hardens, shaping Puppy's behavior becomes more difficult. The two biggest mistakes people make in the first 24 hours with a new puppy. Here are common mistakes that people make in the first week with new puppies. Day Four - Say, "Please!" Teach Puppy to “come” and “sit” before EVERY meal and before getting attention, toys, walks, etc. One key to error-free puppy raising is preventing bad habits AND teaching good ones. Ask yourself, "If this is wrong (a behavior I don't want), what is right (a behavior I do want)?" Day Six - Whose Toy Is It? Here are two common mistakes people make with new puppies that create adult dog problems such as destructive chewing, digging, food bowl aggression, and hyperactivity. Day Seven - Trust is a Must! Imagine an adult dog that is easy for you or anyone else to groom or examine and one who loves to cuddle. Here are two common mistakes people make with young puppies that prevent them for enjoying handling and human affection. Puppy brain development is critically influenced by what the puppy learns and experiences in the first few months of life. You can make a significant difference in your dog’s personality and social skills if you learn how to make EVERY day count! You are more than half way through the first 14 Days. Congratulations! Your relationship with Puppy is a barometer of what you and Puppy are learning. Below are facts to help prevent common misconceptions people have about dogs. What we have here is a species-specific failure to communicate. You can teach your dog an English vocabulary if your are patient, and understand that dogs learn in different ways than people, then adjust your teaching methods. See our topic on the Border Collie that learned over 200 words! Canines are pack animals. It is natural for them to want to be indoors with the family and to be stressed by isolation. Outdoor dogs are harder to train and have more stress-related unwanted behaviors. Teach your dog house rules and keep the family together. The best teaching methods are “hands off” (no force) so the puppy needs to use his or her brain to figure out what behaviors you want. Hand signals and sound signals help puppies learn much faster than English vocabulary alone. Hearing one's name is often considered the sweetest sound on earth. Use Puppy's name with praise and once before giving a cue. Never use your pup's name in anger. Puppies and children can be a great mix as long as you provide 100% supervision and ongoing instruction to both. Do not allow mistakes to happen when you are NOT there. Here are common mistakes people make with children and dogs. It's not fair... to give your little puppy positive attention NOW for behaviors you don't want LATER such as jumping up and licking your face. Your adult dog will not realize that size matters! Week Three - Whoa Nelly! Insist that Puppy wait and allow you to go through doorways first. This helps communicate that you expect respect. Canine's consider going through a doorway first as a privilege of rank. The puppy lunges at the cat, and you say, "Stop!" or "No!" and the puppy stops and sits - then you proceed to tell the puppy, "Bad dog!" If you want to enjoy an adult dog companion that is not easily scared or fearful, you must teach Puppy that most sights and sounds are NOT scary - this includes going to the veterinarian, to the groomer, and outside of the home. Your puppy craves social interaction, therefore, your attention. If you are playing a game, and the puppy play bites your hands or clothing, simply stop playing, turn your back and give the puppy a few minutes of "time out" to calm down. The reason to train with food is to set up your puppy for success and make both learning for Puppy and teaching for you much easier. Pair the treat with a clicker for faster learning! Gentling exercises are a great way to teach your dog to trust you. Once you have earned your dog’s trust, you will be able to touch your dog anywhere, anytime you want and your dog will respond like a floppy, unconcerned rag doll. Introduce these exercises when your puppy has been exercised and is relaxed or tired. Wrong Move: Allow the pup to chew on old shoes and socks, leave squeaky or plush toys in the kennel with the puppy. Right Move: Only allow access to approved chew toys like Kongs, Nylabones, Sterilized Bones, or Dental Ropes. It is safe for the puppy to try to destroy these while confined in a portable kennel, x-pen, bathroom, etc. Just as you may be more motivated by $100 than $10, you need to discover what are low, medium and high value rewards for your puppy. For example, kibble may be low, a cheerio - medium, and freeze-dried liver - high value. Week Eleven - On Your Mat, Matey! 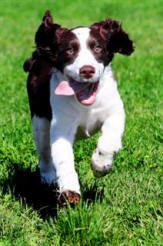 It is very useful to you and your puppy if there’s a place established for your puppy to go to relax and settle. Canines understand “place” and need to know they are in a safe, acceptable place. Unruly canine behaviors can often be prevented or solved simply by reducing canine stress. Canines are intelligent, social creatures that get cabin fever and are stressed by benign neglect that results from many human lifestyles. Your canine is very good at reading your body postures, movements and facial expressions. How good are you at reading canine?